Add flour and baking powder to a mixing bowl and stir to combine. Make a well in the middle and add some milk inside. Crumble fresh yeast over milk. Sprinkle some sugar on top and carefully start to combine until a dough starts to form. Cover bowl with a fresh kitchen towel and let rise in a warm place for approx. 15 min. Melt some butter in a small saucepan, then let cool down to room temperature. Split and scrape seeds from vanilla bean. When dough has risen, add egg, remaining sugar, melted butter, buttermilk, some milk, salt, and half of vanilla bean seeds. Stir to combine. With your hands, knead the dough until smooth. Dust with flour, cover bowl with kitchen towel, and let rise again in a warm place for approx. 60 min. Grease baking pan with butter. Add cane sugar and cinnamon in a small bowl and stir. Flour work surface and roll out dough into the shape of a rectangle until dough is approx. 7-mm/0.3-inch thick. Melt remaining butter in a small saucepan, then spread evently on dough. Sprinkle cinnamon-sugar mixture on top. Roll up the dough like a carpet, starting from the long end. Cut the roll crosswise into equal-sized pieces, each approx. 3-cm/1-inch thick. Transfer into greased baking pan. Cover with a kitchen towel and let rise in a warm place for approx. 90 min. In the meantime, preheat oven to 170°C/350°F. Bake cinnamon buns for approx. 25 min., or until golden brown. Remove from oven and let cool for approx. 10 min. In the meantime, add confectioner’s sugar, remaining milk, remaining vanilla bean seeds, remaining salt, and cream cheese to a small mixing bowl and stir to combine. 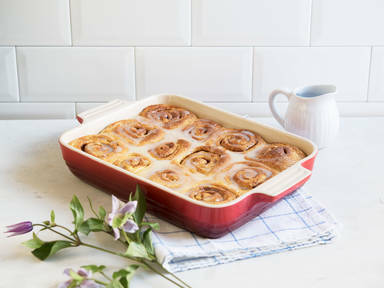 Drizzle over lukewarm cinnamon buns and enjoy!